Who can use the National Archives? Any member of the public in possession of a valid reader’s ticket is permitted to access the reading room of the National Archives. Can children visit the Reading Room? No. Children under 16 years of age are not permitted to access the reading room unless prior approval has been given by the Head of Public Services. The reading room is a quiet place of study containing original archival documents, and is therefore unsuitable for children. Leaving certificate students may be admitted provided they apply for a reader’s ticket and follow the correct advice on accessing and preserving documents. What are the opening hours and document ordering times? 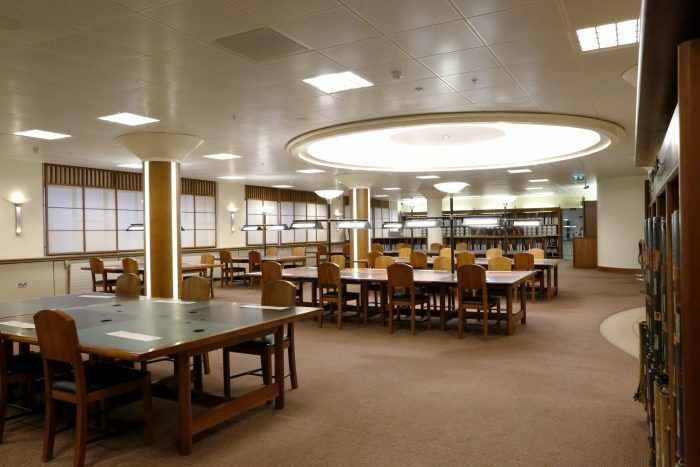 The reading room of the National Archives is open Monday to Friday from 9.15 until 17.00 to members of the public in possession of a valid reader’s ticket. Documents and microfilms may be ordered by researchers from 9.15-12.15 and 13.30-16.00 daily. Archives ordered by a researcher in person which are held in off-site storage are produced in the reading room at 9.15 on the following working day. Researchers are advised to check the status of the archives they have ordered by phoning in advance of their visit. All visitors to the National Archives must sign the Rules for readers when applying for a reader’s ticket. These rules are set out to ensure a comfortable working environment for all researchers and the preservation of original documents. All visitors must leave personal belongings in free, secure lockers. This includes bags, handbags, carrying cases, briefcases, books and newspapers. Visitors may bring a purse or wallet into the reading room. Pencils without a rubber are permitted. The National Archives also provides pencils in the reading room. Pens, highlighters, pencil sharpeners or other items likely to cause damage to archives are not permitted. Newspapers, magazines and books are not permitted. Digital cameras are permitted. No flash photography or use of tripods is allowed. Laptop computers and tablets may be used. Scanning equipment of any kind is strictly prohibited. Food or drink of any kind is prohibited. A water cooler is available in the foyer of the reading room and the locker room. You are responsible for safeguarding the condition of the archives that have been brought to you. You must remain at the desk assigned to you for viewing and photographing of records. You must use any specialist equipment provided, including cushions for large volumes. Only one item may be open on a desk at any time. The archives should remain flat on the table at all times. The archives must be kept in the same order in which they are given to you. If files in a box or pages in a folder appear to be out of order, do not rearrange the archives yourself. Please contact the Archivist on Duty. The reading room is a quiet place of study. We request that you refrain from loud or unnecessary conversations and behave in a pleasant and courteous manner toward staff and fellow researchers. Refusal to follow the Rules for readers may result in the confiscation of your reader’s ticket. A finding aid is a catalogue written by archivists to help researchers determine what records a collection contains. This enables the researcher to determine whether it will be beneficial to their research to consult the records in question ensuring their time in the National Archives is spent as productively as possible. A good quality finding aid also helps to ensure the long-term preservation of collections by avoiding unnecessary handling or trawling by researchers. Finding aids to all recent accessions are searchable in hard copy and in our online catalogue. Older material is not always available online and must be searched using hard copy finding aids or card indices, which are available in the reading room. Please consult the Archivist on Duty in the reading room with any questions relating to finding aids. How do you access archives in the reading room? Once the researcher identifies the correct reference code, this is filled out on a yellow order docket and given to the staff at the counter in the reading room who will then arrange for it to be retrieved from the stacks or storage areas. For information about accessing material held off-site please see Ordering archives in advance. Archives can be arranged as an individual item, a file or a box of material. The order in which the documents are produced is extremely important and researchers must never take it upon themselves to reorder items within a file or a box. The sequence in which the material is presented preserves the filing system implemented by the creating organisation. This filing system can often provide as much information about the archives as the actual documents themselves. Any attempt to rearrange the original order can result in the loss of potentially vital information and must never be attempted. If researchers are in any doubt or find a file has been tampered with please bring it to the attention of the Archivist on Duty in the reading room. Are archives fragile and how do I handle them properly? Archival records are unique and must be handled with extreme care. The National Archives endeavours to facilitate access to original documents wherever possible. In cases where the condition of the archive is unstable or fragile, a surrogate copy may be provided. Where archives have been digitised or microfilmed, access will not be given to the original record. Ensure your hands are clean and free from any hand lotions and moisturisers. Dirty hands and lotions will cause the paper to stain and accelerate the deterioration process. Do not lick your fingers to turn pages as this will also stain the paper. Pages must be turned in a gentle and careful manner, especially when working with thin or fragile folios. Please handle all archives and finding aids with due care and consideration. Never force open a volume or a file. If you are unable to obtain information from a tightly bound volume, bring it to the attention of reading room staff or the Archivist on Duty. Archives must remain flat on the table at all times. Researchers must never lean on, or trace from any records or use them as a support for writing. Only one file or document may be open on a desk at any one time. Researchers must never stack open files or place files within other files. This may result in damage to binding or files may become disorganised and the original order lost. Clean coloured paper strips are available in the reading room to enable researchers to mark pages. Do not use Post-it notes or bulky objects such as pencils and glasses as place markers. Do not underline, highlight or mark archival records in any way. Any attempt to deface archival material is a criminal offence under Section 18(2) of the National Archives Act, 1986. How do I return archives when I am finished my research? When a researcher is finished consulting archives that have been issued to them, they are responsible for returning them to the returns desk, which is located beside the reading room. It will not be possible for any further items to be issued to a researcher until the first item is returned. A document management system is in place for this purpose. When an archive is issued to a researcher it is scanned out using the researcher’s reader’s ticket. If the item is not returned and scanned back it will be highlighted on the document tracking system. If an archive, such as an outsize volume, is very heavy please ask for help from the reading room staff. Do not attempt to lift material that is too heavy. Can I consult the same archives on a subsequent visit? Yes. If a researcher is not finished with the archives they were consulting, they may hold them out in the overnight store to be consulted the next day. This facility is provided to help maximise the time researchers spend in the National Archives. Researchers who are found to be holding out material and not returning may have this privilege removed. A yellow ‘Hold Out’ form is available beside the main counter in the reading room. Is it illegal to bring material home with me? Yes. Archives held in the National Archives are unique documents. Any attempt to remove records from the reading room is a criminal offence under Section 18(1) of the National Archives Act, 1986. All documents are issued using a document tracking system and can be traced to an individual. Any attempt to remove or deface archives will be reported to An Garda Síochána. What computer facilities are available in the Reading Room? There are a small number of PCs available in the reading room for researchers to consult online sources. These are reserved for relevant research only. During busy periods, researchers may be requested to vacate the computer. Power points have been installed at a number of tables to facilitate the use of laptops by researchers. While researchers are permitted to bring laptops into the reading room with them, they are requested to leave laptop cases and covers in the lockers provided. Free wi-fi is provided in the reading room. The access code may be obtained from the Archivist on Duty once a researcher agrees to the terms of the National Archives acceptable usage policy. What microfilm facilities are available? Traditional microfilm readers, a microfiche reader, microfilm printers and scan-pros are all available in the reading room to facilitate access to archives only available for consultation on microfilm. If you are unsure how to use a microfilm reader please consult staff at the reading room counter for assistance. Reading room of the National Archives.